My first task was to write a letter. Sounds easy enough, right? I mean, on the average day I put out between 1,000 and 4,000 words. What’s a letter? But it just wasn’t that easy. I prayed over it, wrote it, read it, and moaned. I prayed some more, rewrote it, read it, and moaned again. After more than three hours spent with non-cooperative words and sentence structures and that constant clicking overhead, I needed a break. I knew the weather forecast for the rest of the week was bad. They were even calling for snow on Friday. So, I decided if I was going to see any of the countryside, this was the time to do it. The fresh air would help clear my mind. I could pray over the project and ask the Lord for clear direction—I had no idea how literal that prayer would become. 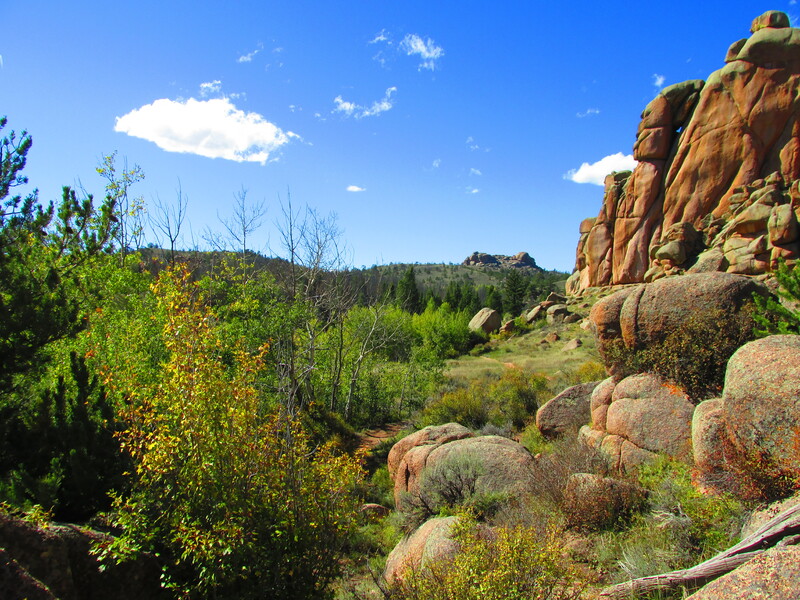 I headed out to a recreational area in the Medicine Bow National Forest. Once there, I parked my car and set out to find a good hiking trail. The first one came to an abrupt end after about ½ a mile. So, I went back through the parking area to a trailhead someone had mentioned along the way. 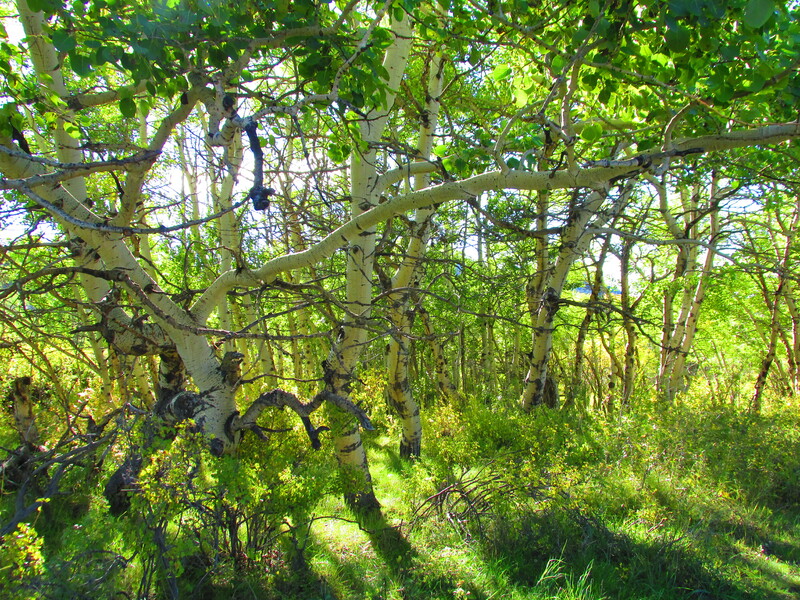 The trail was beautiful: Groves of Aspen, thick underbrush, fall colors sneaking in among lush greens. I saw a little sign that read “Campground gates close at 8pm.” It was only 2:15. I wasn’t worried about the closing time anyway. I had promised myself I would only hike 2 hours from the time I arrived at the recreational area. I would be done by 3:40. I passed through a gate a few steps further and assumed this was the trail leading to the campground which seemed like a good target. I’d hike to the camp, turn around, and hike back. I was amazed at how much distance I was covering, even stopping to take pictures here and there. 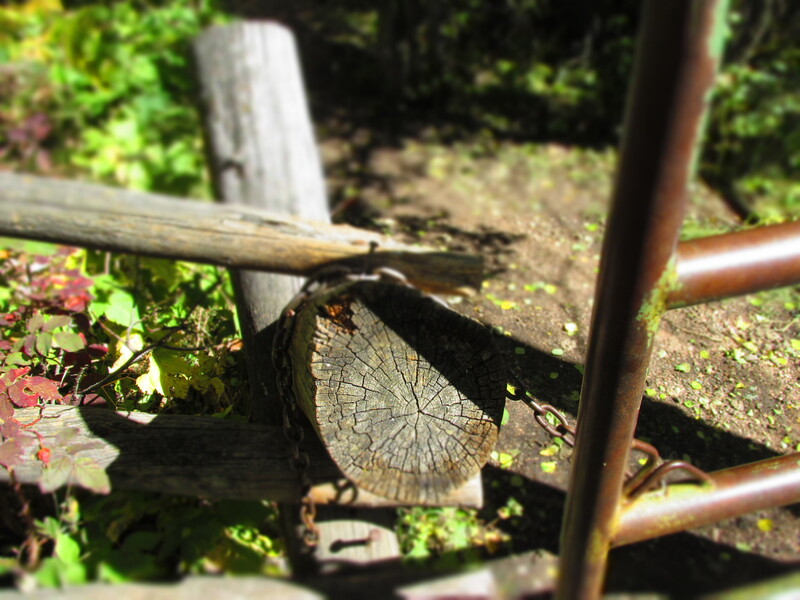 When I reached the halfway mark in my time, however, I still hadn’t reached a campground. I knew the first short hike had taken about 30 minutes, so I figured I could do about fifteen more before I needed to turn around. But it was in those fifteen minutes that the trail started going places I hadn’t expected. It started going up, then down, through boulders and around the banks of beautiful little ponds. I thought that was a little strange, but I had a good idea of where I was and wasn’t too concerned about it. One of the most beautiful spots along the trail. 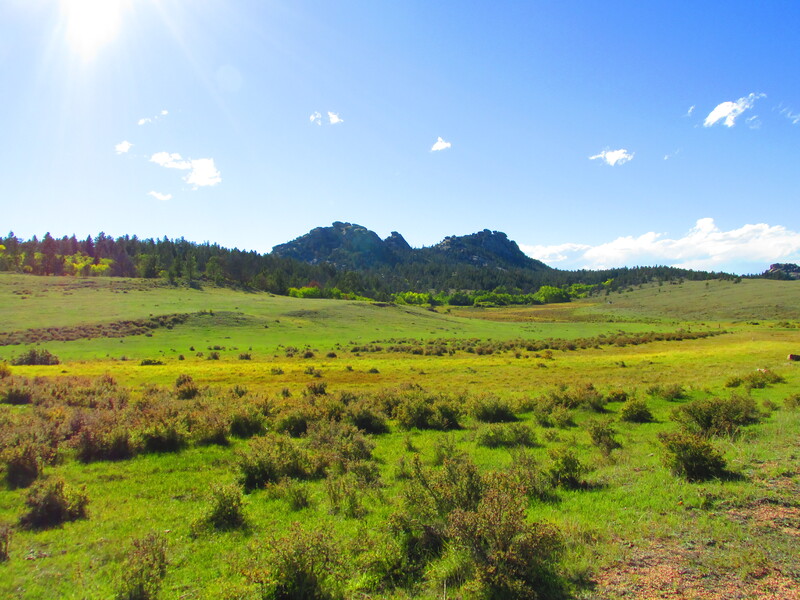 By the time the fifteen minutes were up, I had gone so far around the rock formation that I realized I wasn’t on a trail to a campground. I was on the trail that circles the rock. I decided I might as well just go on around; it would probably be shorter that way. 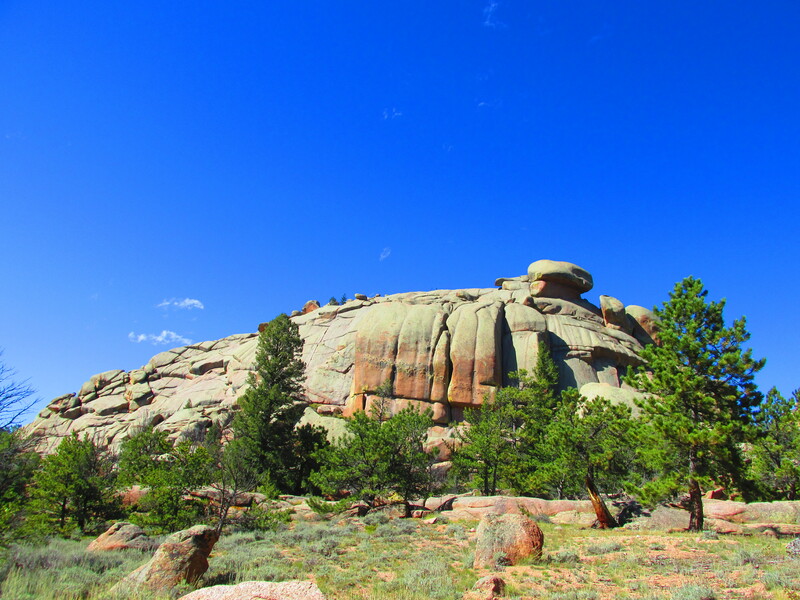 Turtle Rock – That’s one big turtle! Before long, however, I started having doubts. The trail went higher and higher. Sometimes it would disappear for ten or twenty feet, but I always seemed to find it again. I knew where the sun was and had a good idea of the direction I was headed. I knew I was going the right way, but I couldn’t figure out how the trail leading up the mountain, was going to get me back to my car 8,500 ft. below. “God of Eternity, the Ancient of Days! I hummed it. I whistled it. I sang. On and on the trail went, always bending just enough in the right direction to encourage me, but never quite convincing me it was going where I was going. Finally, I came to a fork in the path. It was a pretty spot. 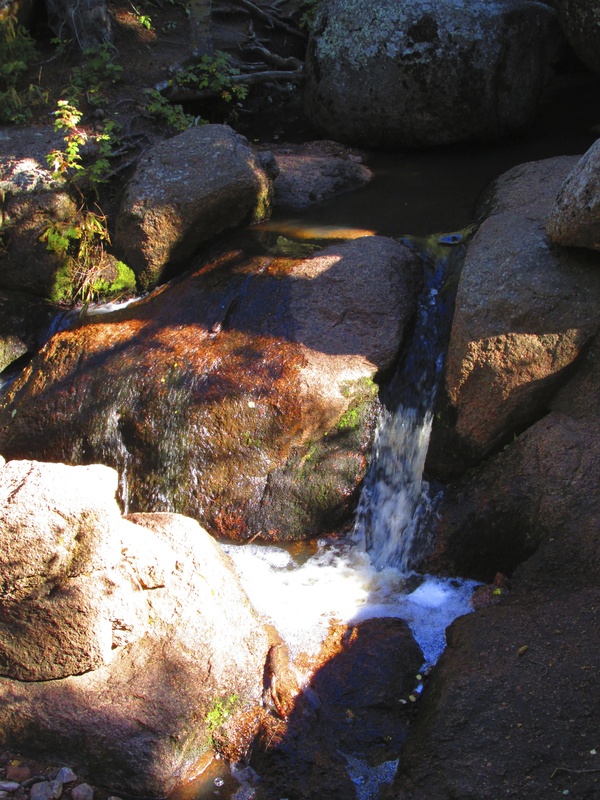 A small waterfall cascaded into a little pool of water that spilled into a creek, which tumbled down the hillside. Here, after nearly two hours of walking, was the first trail marker I had seen on the entire trek. But it was pointing in the direction from which I had come. I looked at it from several different angles, trying to decide which trail was supposed to be seeing it. It seemed like you should see it coming from the falls, but I didn’t see a path there. On the other hand, a very clear path came up behind it. 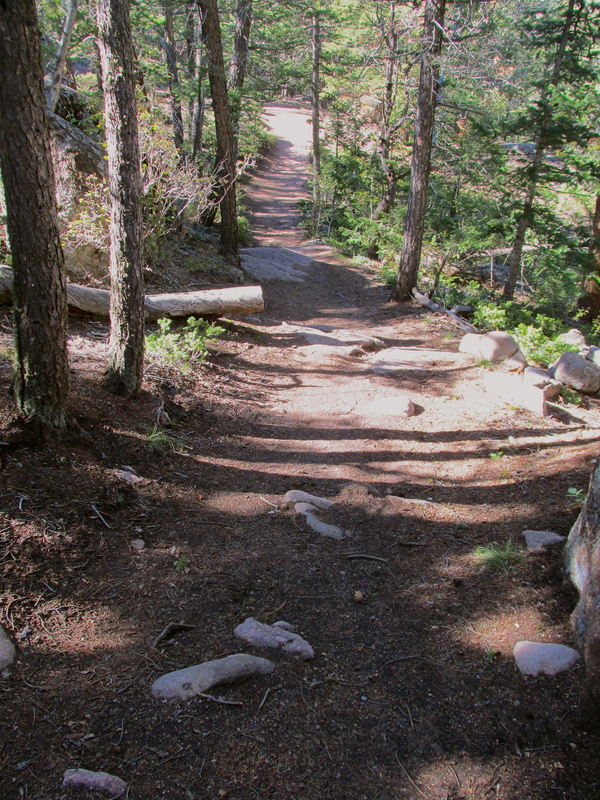 So, deciding this was a switchback in the trail, I followed that clear path. The road opened out onto a large, spreading meadow. As I jumped over a small stream, I looked ahead. I could see the dirt road following the eastern most edge of the meadow and then curving around to go full west on the other side. By now, I was convinced I was not where I was supposed to be. It was well past the time I’d allotted myself. I had work to finish up and I HAD to get to my car before 8 p.m. I didn’t want to sleep in my car in a campground that I had yet to find. I looked at the meadow and made the decision any person who knows the shortest distance between two points is a straight line, would have made—I cut across the field. The place where I had crossed the stream was its regathering point. Upstream the creek had spread itself across the full width of the lowest part of the meadow. The part I was crossing. Soon I was ankle deep in cold, mountain spring water. 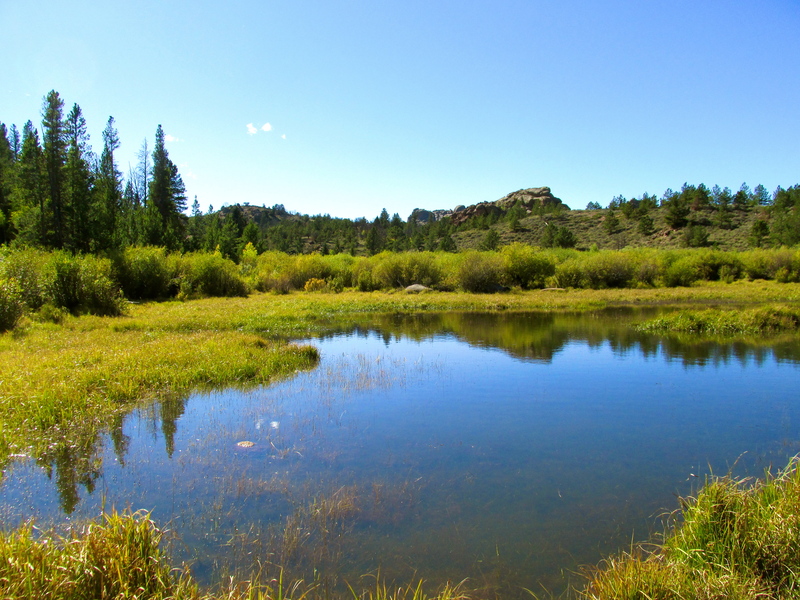 Even though I came out wet, when I looked back across the meadow, I realized that, just like many of life’s trials, it was one of the most beautiful places I had seen. Soon enough, I slogged back up onto the road and trod on, my feet sopping. After about ten minutes, I came to another fork in the road. Here, there was a sign. It had numbers on it: numbers that wouldn’t have helped me even if I had brought along the rather useless map provided at the park entrance. Just beyond the parking lot was another crossroad. Again, I continued west, praying, “Lord, please help me to know which way to go. Help me to see familiar rock formations or landmarks.” I came through a shallow valley with several roads and paths leading off of it. I ducked down a short trail to see if I could see anything from the top of the ridge, but all I could see was trees. Wasting no time, I hurried back to the road and resumed my original direction. By this point, I was seriously beginning to think I would be spending the night at the recreational area. I knew enough to understand that the service road had brought me much too far east to be anywhere close to where I had parked my car. I had followed it for close to two miles. I had no idea how far off the actual trail I had been when I had started down the road. I knew I had probably averaged a 22 or 23-minute mile pace. Which put me about 6 miles from my starting point. I guessed that I was probably about 3 miles east of where I was supposed to be. The road was good, but the climbs were steep. I guessed that I had a minimum of two hours back to the point where I was hoping the road would come out. By then it would be nearly seven and I would have just shy of a mile to walk to my car. I could still make it by eight…There was just one other thing…it would be dark long before eight o’clock. As I neared the top of a long grade, I thought over the options. I had prayed everything I could think to pray, except for one thing. I walked on, but then, about 30 seconds later, I heard something. At first, I thought I was just imagining it, but then I heard it again. It was the distant rumble of tires on gravel. My first thought was the black truck in the parking lot. But then I remembered what I had just prayed. I heard the vehicle round the bend behind me, stepped off the road, and turned to look. It was a beautiful, white, Forest Service pickup…and they had an extra seat. My estimate was about right. It was close to three miles to the place where the gravel road met the pavement at the gate to the recreational area. The FS crew dropped me off there, and I walked back to my car. It was 4:40. All that, and I was only an hour later than I had planned. As I thought through the day, I realized a few things. That little adventure, was very similar to many moments in life. We step onto a path, knowing God is leading in that direction. The signs are very clear. But as we continue on, we realize that we don’t know exactly where it’s going. Sometimes we lose sight of it, and we wonder if we have missed it, but then He makes it clear again. Sometimes we get bogged down in the mire of muddy meadows, we get caught in a tangle of trees, we come to a fork and have to pray long and hard before choosing which way to go; and yet, because we let Him lead us, in the depths of our heart we know we’re going in the right direction. God’s provision to get us to the end of that path, is always just on time. And in that moment of provision, we see we did not sing in vain. In that moment, the prayer, “Be Thou Exalted” is answered. Are you on a path that seems to be leading in a direction you didn’t expect? Is it the way God led you? If so, just keep trusting. Keep following through the mud, the trees, the steep inclines—He never fails. What’s your story? I’d love to hear in the comments below how God is leading you. 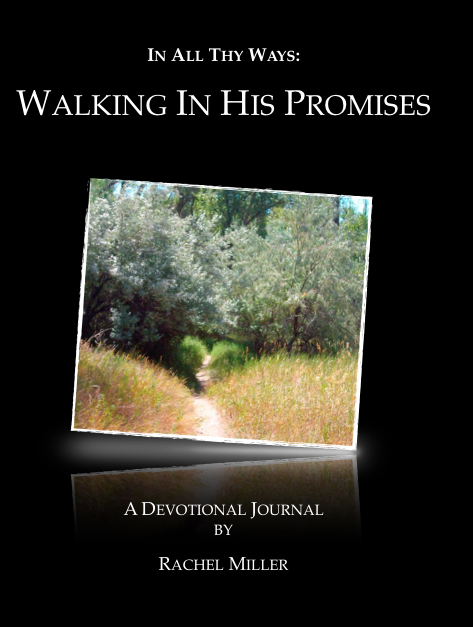 I am the author of three books, including the Walking In His Promises, devotional journal. You can check them all out here. I also run a Christian editing and writing service. I hope you all you writers will check it out and let me know how I can help you.